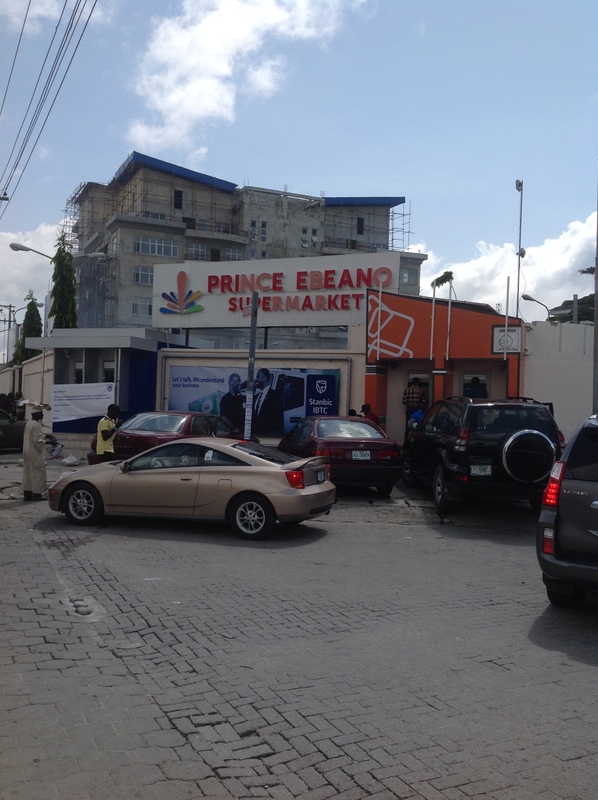 The only untouched feature of Prince Ebeano Supermarket is a clean, multicolored signpost emblazoned with the name of the premium shopping centre that served residents of the exclusive Lagos neighbourhood of Lekki Phase I. It still stands at the front of the retail store, overlooking the west side of Admiralty Way as it gazes at motorists and passersby -soliciting patronage. “As you can see, that’s the only recognisable property left,” says Ngozi Irikefe as hot smoke billows through the burnt roof of what used to be a bubbling property almost a day after a runaway inferno consumed it; her only means of livelihood turned into a disaster facility by the fire whose cause authorities have not been able to establish. “Even if I sell everything I have and liquidate my bank accounts, I still won’t have a third of my loss in this fire,” Irikefe says as she struggles to fight back her tears. Her nervous twitch eventually gives way to emotional pressure, causing her to bawl uncontrollably. She’s come a long way. Irikefe grew up in the most humble of homes in the historic Igbo settlement of Arochuku in today’s Abia State. She barely completed primary school before being brought to Lagos by her uncle at the age of 14. For the intervening three decades, Irikefe will sleep in hazardous plastic manufacturing factories operated by Indians at Ilasamaja, hawk household supplies on Lagos highways, and clean dishes and flip hamburgers for fast-food restaurants. The mother of two university sophomores believes she has been dealt a bad hand by fate. Now a supplier of oral care products, she assumed her breakthrough would last. Her clients had increased their demand in a desperate bid to stock up products ahead of the Christmas and New Year holidays when consumer sales are expected to skyrocket. She wasn’t expecting to get paid until Wednesday, the day after the fire outbreak. Because of the complicated conditions to which suppliers like hers are subjected, Irikefe put her loss at millions. She raised her head to gaze at a television antenna planted where the roof of the supermarket used to be. It survived, but its cables were incinerated by the inferno. Irikefe turns 50 in two weeks, an oxymoronic milestone that leaves her more puzzled than fulfilled. Her last delivery of oral care products contained exactly 50 boxes and it’s been only 50 weeks since she started supplying the Lekki outlet of Prince Ebeano. Like Irikefe, other suppliers formed chat groups outside the main gate of the supermarket, desperate for any information they could get from the management. Some of them said they arrived as early as 4 a.m. Wednesday, but haven’t been able to get the attention of Prince, one of the two brothers who manage the venture. Prince is said to be the brother of Ebeano, which explains how the duo arrived at their business name. Prince declined all media requests, preferring instead to spend his time doing a pirouette around the facility, his macho posturing belying an unyielding anguish. His black 2012 5-Series BMW saloon parked isolated in the compound, its paint unlikely to get any scratch from drive-thru customers, for now. By Wednesday morning, the fire was 99% contained, but with very little left for business owners to be grateful for. A line of torched carts buried in ashes were packed at the lower end of the parking lot and desperate retailers assessed the compound for any valuable item. To the delight of Prince Ebeano’s neighbours, only the supermarket building was affected by the blaze, which began at 4:56 p.m and rapidly ripped through the entire building, scorching billions of naira worth of products and supplies. Its proximity to the Lagos lagoon made no discernible difference to firefighting efforts. Around noon on Wednesday, officials from the Environmental Sanitation and Waste Disposal Unit of Eti Osa Local Government Area were focusing on a mop up operation. But a light cloud of smoke still hangs over the rubble. Despite its destruction, owners of Prince Ebeano Supermarket said they have a lot to still be thankful for. Perhaps it’s the only rational thing to do: the venture has 5 other retail stores scattered across Lagos. Mr. Ebeano, co-owner of the business, can be seen noting down some observations, some of the suppliers mouth that a reconstruction plan is already underway. This possibility was echoed by a very close aide of Mr. Ebeano who told Happenings the brothers are “not having a sleepless night over the matter.” “At all,” he emphasised. Firefighters who responded to the emergency refused to speak on the record, but they said an investigation will commence after a holistic examination of the scene. 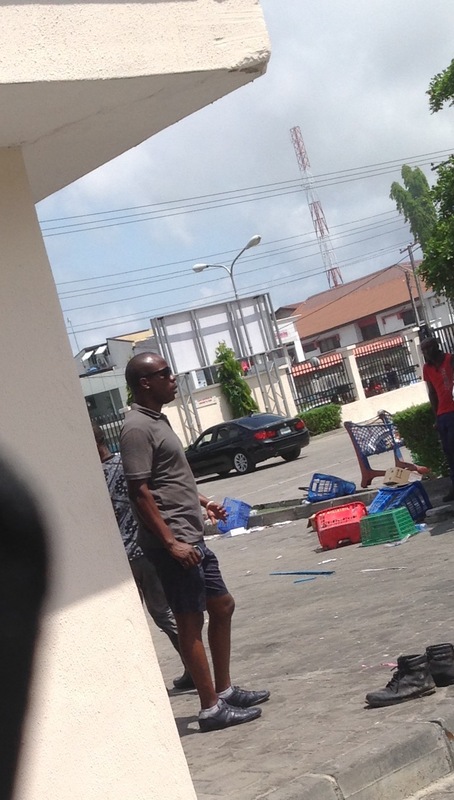 Joe Offor, the Police Public Relations Officer, told Happenings an “Investigation is seriously underway to ascertain the cause of that terrible fire.” His follow up statement that “No case of arson is suspected” may have come as a relief to other outlets of the supermarket chain, but it did little to assuage the fears of suppliers like Andrew Omosewe. While business owners whose shops have been gutted by the inferno sit idle, handicapped by their untold losses, the staff of So-Kleen, a medium-scale cleaning service, are having their busiest day of the year. Olumide Igbalaye, its director of operation, shuttled between the compound and his office at Ikota at frequent intervals. His fatigue easily communicated by his wet jacket. While all the merchandise in the building were completely destroyed, a few newly delivered items awaiting clearance before the inferno on Tuesday were piled up outside the premises. The owners were advised to transport them away from the compound. One teenage scavenger made away with a pair of partly scorched shoes from the debris which promptly nudged Irikefe back to reality.